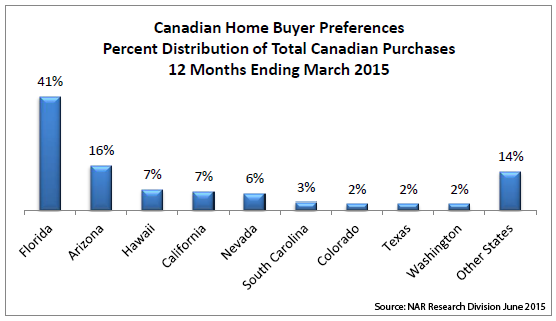 The National Association of REALTORS® (NAR) reports that Canadians spent about 20% less on all U.S. properties year-to-year from April to March, but still accounted for $11.2 billion dollars in total value. Arizona is second only to Florida with Canadians investing almost $1.8 billion in the Grand Canyon State. In its 2015 Profile of Home Buying Activity of International Clients, the NAR reports that “on average, Canadian buyers purchased a property valued at $380,300” and about 73 percent paid cash. When the Canadian exchange rate is significantly higher than the U.S. dollar, she sells more property to international investors. “Right now, I’m just as likely to lease vacation rentals,” said Hazen. NAR statistics agree with vacation homes edging out residential rentals by more than 2 to 1. Using tourism alone as an economic indicator, prospects are looking good. According to the Canada Arizona Business Council (CABC), nearly 800,000 Canadians visited Arizona in 2013.